PESHAWAR, Pakistan, Oct 8 2014 (IPS) - Imagine traveling for almost an entire day in the blistering sun, carrying all your possessions with you. Imagine fleeing in the middle of the night as airstrikes reduce your village to rubble. Imagine arriving in a makeshift refugee camp where there is no running water, no bathrooms and hardly any food. Now imagine making that journey as a pregnant woman. In northern Pakistan, a military campaign aimed at ridding the Federally Administered Tribal Areas (FATA) of Taliban militants has led to a humanitarian crisis for hundreds of thousands of civilians. When the army began conducting air raids on the 11,585-square-km North Waziristan Agency on Jun. 15, residents were forced to flee – most of them on foot – to the neighbouring Khyber Pakhtunkhwa (KP) province, where they have now taken refuge in sprawling IDP camps. Officials estimate the number of displaced at just over 580,000, of which half are women. In the ancient city of Bannu, which now houses the largest number of refugees, some 40,000 pregnant women are facing up to their ultimate fear: a lack of hospitals, doctors and basic medical supplies. For 30-year-old Tajdara Bibi, a mother of three, these fears became a reality in June, when she had to flee her home in North Waziristan and trudge the 55 km to KP along with her fellow villagers. The journey wore her down, and by the time she was admitted to the maternity hospital in Bannu, the doctors were too late: she delivered a stillborn baby a few hours later. Muhammad Sarwar, who attended to Bibi, told IPS that an extreme shortage of female doctors has put pregnant women on a knife’s edge. “At least four women died of pregnancy-related complications on the way to Bannu, while 20 others had miscarriages at the hospital,” he said. “We have only four female doctors in the whole district, who are required to provide treatment to all the women,” he added. With thousands of women now clamouring for care, the province’s limited healthcare services are falling short, sometimes with disastrous consequences. Gul Rehman, a 44-year-old shopkeeper, is still reeling from a recent tragedy. He told IPS his wife went into labour prematurely during the arduous journey to Bannu. “We could not find transport so we had to walk. When we finally reached the hospital, we were kept waiting… there were no doctors readily available. “After 10 hours, they finally operated on my wife – but the baby was already dead,” he explained. Aside from the trauma of losing their child, the couple is also struggling to cope with the wife’s health condition, which has deteriorated rapidly after the stillbirth. 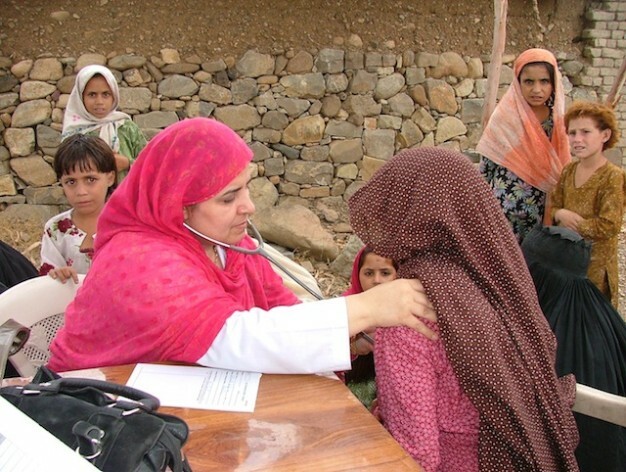 According to Fawad Khan, Health Cluster and Emergency Coordinator for the World Health Organisation (WHO) in Pakistan, existing health facilities are not equipped to deal with the wave of arrivals from North Waziristan. Some 30 percent of pregnant women among IDPs are at risk of delivery-related complications, a situation that could easily be addressed by upgrading existing facilities. There is also an urgent need for gynaecologists to provide antenatal and postnatal care, he stated. Twelve health centres have already been established to tackle malnutrition among women and children in the camps. Without proper nourishment, officials fear pregnant women will face additional complications during birth, and low birth-weight among newborns could create additional challenges for health workers. “Four percent of the total displaced women are pregnant and need immediate attention,” Abdul Waheed, KP’s director-general of health, told IPS, adding that some 20 basic health units have already been strengthened to take on those most in need. Still, the crisis has reached proportions that even seasoned officials are scarcely able to comprehend. Waheed explained that Bannu has never before had to host such a large population of homeless people, and is struggling to cope. Prior to the recent wave of refugees from North Waziristan, the KP province had already welcomed over 1.5 million people from FATA. This latest influx brings the number of displaced since 2001 to over 2.5 million. “We are sending doctors from teaching hospitals in Peshawar [capital of KP] on a rotational basis to meet the situation,” he asserted. The United Nations Children’s Fund (UNICEF) and the U.N. Population Fund (UNFPA) have joined the WHO in supporting the Pakistan government’s push for improved health services. Some 65 doctors from the Pakistan Institute of Medical Sciences (PIMS) in Islamabad have joined NGO workers in Bannu to provide urgent care. Part of the problem, according to Ali Ahmed, KP’s focal person for IDPs, is that few medical professionals are keen to take up posts in the militancy-infested region. For years the Taliban have operated with impunity in these federal areas, hiding out along the mountainous border with Afghanistan that stretches for some 2,400 km. The military’s counter-insurgency programme was launched in a bid to finally wipe out extremist elements that fled Afghanistan during the U.S. invasion in 2001 and took root along the porous border. But until the region regains a sense of normalcy, it will be hard to lure professionals here, officials say. Despite being offered lucrative packages, doctors have refused to take up posts, even temporarily, in Bannu. The government is looking to fill this gap by appointing 10 doctors, including five female doctors, to the newly renovated Women and Children Hospital, which remains understaffed and ill equipped. The city’s other two category ‘B’ hospitals, the Khalifa Gul Nawaz Teaching Hospital (KGTH) and the District Headquarters Teaching Hospital, suffer similar setbacks, while the arrival of the IDPs has more than tripled the number of patients demanding services, Ahmed said. Three rural health centres in close proximity to the refugee camps, as well as 34 basic health units, have received an injection of funds and resources, and 20 assistant nutritional officers have been deployed to cater to the needs of 41 percent of affected children, he told IPS. But far greater efforts will be needed to tackle the crisis, which is compounding an already bleak picture of maternal health in Pakistan.